Wouldn’t it be great if every kitchen tool had nifty features that helped reduce the amount of time it takes to prep ingredients? Alas, some gadgets are smarter than others. Lucky for you, you found your way to this post so you’re about to meet one of the smartest kitchen tools we’ve come across in quite some time. The Oster 270-Watt Hand Mixer with HEATSOFT Technology is unlike any hand mixer you’ve ever used before. 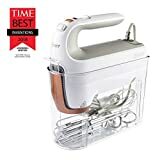 This brilliant mixer heats as it mixes, softening your ingredients so they combine more quickly. Traditionally tricky things like cold butter soften an impressive 12 times faster, and you’ll wonder how you ever lived without it.